Carolina moonseed is one of Missouri's smaller vines. The inconspicuous flower clusters appear in the summer and by October have become clusters of brilliant red, nearly transluscent berries. Birds will often leave them alone until late in the year when other food sources are diminished. Alkaloids make them inedible for humans. The attractive shiny leaves are usually heart-shaped or three-lobed. With very cold winters, Carolina moonseed often dies back to the ground. It will resprout once the weather warms up. 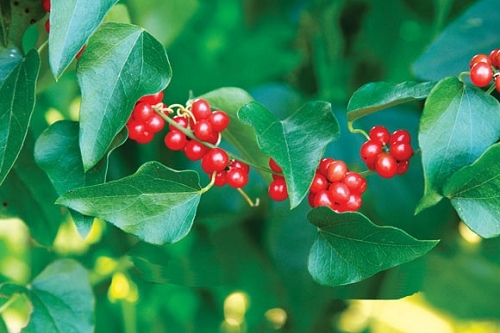 Plant it near a trellis, some shrubs, or other vines that it can climb on.